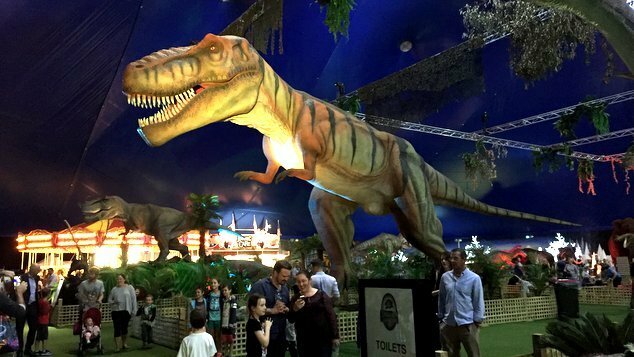 Jurassic Creatures has opened at Crown Pyramid and it’s promises to fulfill a dinosaur enthusiasts wildest dreams. To test the claim we took the biggest dinosaur obsessives we know to see the show. Benjamin, who is almost three, lives and breathes dinosaurs, so he came along to the interactive exhibition as our guest with his six year old sister Isabel. Outside the Crown Pyramid is where you first meet a dinosaur, which was exciting and wonderful, until it came to life and roared! Having spent many hours answering questions about dinosaurs, and swearing that they were all extinct, we know had some explaining to do about how this one was moving and growling. We spent quite a while hanging out with the animatronic creature at the front of the exhibition to get used to the idea, before we headed inside. Once in the vast expanse of the Crown Pyramid there were giant dinosaurs everywhere. The kids ran from one to the next, showing they already knew the name of each species and rattled off facts and figures. Dinosaur characters roamed the aisles and allowed people to get up close. The Woolly Mammoth section was clearly the favourite, with snow intermittently spurting up into the air and down on to mesmerised faces. There we massive bouncy castles to explore, carousels to be ridden and a humongous giant slide to be climbed and slid down. Ben was particularly excited about the giant slide, and we prepared to break the news to him that he probably wasn’t tall enough. As he stood next to the height check we were amazed to see he scraped in with just millimeters to spare. If he doesn’t grow up to be a paleontologist, a career in mountaineering beckons. A loud speaker announcement declared a show was about to start, The Flintstones are here! The door to the auditorium opened and we rushed in to get good seats. Do kids today even know who The Flintstones are, we wondered. A quick viewing of the opening titles on an iPhone provoked an “Oh, these guys!” response from Isabel. Soon Fred, Barney, Wilma and Betty were out on stage belting out songs with a troupe of backing dancers. The star of the show though was Dino – he’s the greatest dancer. Later we’d learn that one of Perth’s best know drag stars was the talent underneath Fred Flintstones’ suit. As the cast invited all the kids to congregate at the front of the stage and join in the dancing, we couldn’t help but think how much it looked like a miniature version of Connections’ dance floor. Some kids danced with wild abandon, others were a little more restrained, a few just watched from the sidelines. Ben was clearly quite taken with Dino and sitting in our seats watching him we wondered if Fred and Barney were prepared for a two year old launching himself on to stage. “Do you think he has the upper arm strength to pull himself up?” we pondered. After the show we checked out some of the dinosaur activities in the main auditorium. We picked a task where you don a white lab coat and safety glasses and partake in an archaeological dig. Armed with a hammer and a chisel, the task was to break the plaster-cast egg and discover the dinosaur skeleton within. Amazingly we survived the experience of holding a chisel for a two year old armed with a hammer, and a souvenir of the experience was revealed. Time had flown by, the two hour session was coming to a close, we had one quick zoom around the auditorium to revisit our favourite dinosaurs and get covered in snow one last time. Jurassic Creatures is totally brontosaurus.